The OPA is designed for adding 16-bit ADC inputs and analog signal conditioning to embedded controllers. The OPA has eight operational amplifiers with high input impedance, which by default converts industrial standard +-10V analog input signals to 0-4V analog signals. 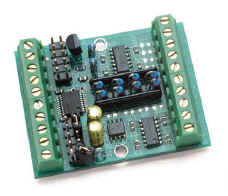 The 0-4V analog signal can then directly feed into the ADC, external or on-board. These inputs are then compatible with many ADCs on existing TERN controllers that only only accept 0-5V input ranges. An optional 8 channel, 16-bit ADC (ADS8344, TI) can be installed on-board. The 16-bit ADC provides 8 single-ended or 4 differential analog inputs (0-4V) with a precision of 65536 counts of resolution at up to 10 KHz sample rate. By moving the ADC onto a separate expansion board, you can also reduce noise associated with ADC chips mounted directly to the controller itself. Any TERN programmable embedded controller can interface to the OPA’s 16-bit ADC via two TTL outputs (CLK, DIN), and one TTL input (DOUT). For applications requiring many ADC inputs, multiple OPAs can interface to a single TERN controller, sharing common CLK and DIN, with a separate DOUT input for each OPA. For example, 2 OPAs, providing 16 channels of 16-bit ADC input, require only 2 TTL outputs and 2 TTL inputs. Sample programs (source code) are available for interfacing the OPA with any TERN controller. All +-10V analog inputs are connected to the OPA via on-board screw terminals. The TTL I/O signals can be connected to the OPA via either screw terminals or pin headers. The analog signal conditioning circuit outputs 0-4V signals, which are routed to pin headers for external use. A 4.096V precision reference with low temperature coefficient (100 ppm per degree C) is on-board and is also available on the screw terminal. The OPA can be powered by 5.1V to 12V unregulated DC with on-board regulator. It also can be powered by a regulated external 5V DC. Special customized versions of the OPA is available for OEM customers, supporting (for example) 4-20 mA analog inputs, or providing differing gain for voltage analog. Power Input: +5.1V to +12V unregulated DC, or 5V regulated DC.